It is my pleasure to share with you a guest post from fellow natural hair aficionado, Christine Lowe-Woolard. Christine is a mother of three and the owner of neosoul.essentials, llc. Founded on the principles of natural skin and hair care, neosoul.essentials, llc carries natural, paraben free products for hair and body. Visit http://www.neosoulessentials.com for product information. Follow her on Twitter at @Christine_LW. Enjoy! I am privileged and pleased to have been given the opportunity to write a guest post for the Natural Afrodisiac. I love reading blogs about natural hair and reading about others’ ideas, conditioning recipes, products and hairstyles. A little, teeny, tiny bit about me, then onto the good stuff. I became natural about seven years ago. I had worn a relaxer for almost EVER and was tired of the curling, the blow drying and whole the “don’t get my hair wet” syndrome I had to follow to keep my hairstyle flowing. I was five months pregnant with my first child and trying to transition with four inches of relaxed hair and two inches of new growth. The two textures were fighting each other and I STILL had the “don’t get it wet” problem because I was styling it using curlers. On Halloween, 2002, I looked in the mirror at my hair and said that’s it. I cut off that dry brittle four inches and had a beautiful crown of two inch long curly, cute Afro hair. And I haven’t looked back since. One thing I’ve noticed about my hair in general – whether it is relaxed or not – is that it is dry. When I read blogs, there is always a question about how to get more moisture into the hair and to keep it moist. I wanted to take this time to share some of my natural recipes that I’ve created, used and gotten off the Internet that have worked for me. I’m a huge proponent of natural remedies and the like, so most of the ingredients that I use, you can easily get from your neighborhood drug store or grocery store. Feel free to copy and paste, ladies! Deep Conditioner and tasty condiment? Mayonnaise can be your BFF. And I’m talking about REAL mayonnaise, not salad dressing. 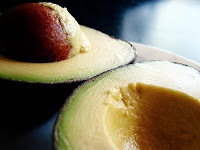 Mash ½ very ripe avocado and mix it with a small jar (approx 1 cup) of real mayonnaise. Apply to the hair and pop on a plastic cap. Leave the mixture on for about 30 minutes (or longer), then rinse out. Should leave hair soft and moisturized. Brown Sugar Scalp Scrub stimulates your scalp and gets rid of dry, scaly dandruff. I prefer using oils only, so that the sugar does not dissolve. Mix ½ cup of turbinado sugar (Sugar in the Raw) with about ¼ - ½ cup of your favorite oil – olive, coconut, soybean…you choose. Make sure the mixture isn’t too runny, so that you don’t have the stuff running in your face. Rub gently into your scalp and enjoy the feeling of those sugary crystals giving making your scalp tingle. Rinse clean. These are the two recipes I use to keep my scalp stimulated and my hair moisturized. I certainly hope that you will find them as helpful as I have. I never thought of using a scrub on my scalp! Great suggestion. It sounds like a great way to fight build-up on the scalp.